One of the greatest things about having a professional email signature is the ability to schedule meetings or appointments with your clients with the click of a button. In this article, we will show you how to add a “Schedule a Meeting” button to your email signature. If you’re a real estate agent, mortgage broker or consultant and you regularly need to book appointments and meetings with your clients, you should really consider adding a button to your email signature where your clients can easily schedule a meeting with you. It saves a lot of time, and looks really professional! Select your email signature from Signatures tab and then click on the Layout tab. If you haven’t already created an email signature, click New Signature and follow the prompts. In the Layout tab, figure out where you want your new “Schedule a Meeting” button placed and click the + button. Don’t worry if you place it in the wrong section, you can always move it by dragging and dropping. From the dropdown list, select “New Custom Field”. For the field label, type “Schedule a Meeting” or anything you like (this is just an identifier so you can find it later). For the type of field, select “Image”. Go to the Details tab, find the new field that you just created and click on it. The field should be called “Schedule a Meeting” if that is what you put in the field label in the last step. Adjust the “Apply this field to” toggle to either “This signature” or “All signatures in this group”. Most of the time for a schedule meeting button, it would be “This Signature”. From here, you can upload your own “Schedule Meeting” image. There are plenty of free images available to download from stock image websites. This gives you the ultimate flexibility since you can use any image you like. 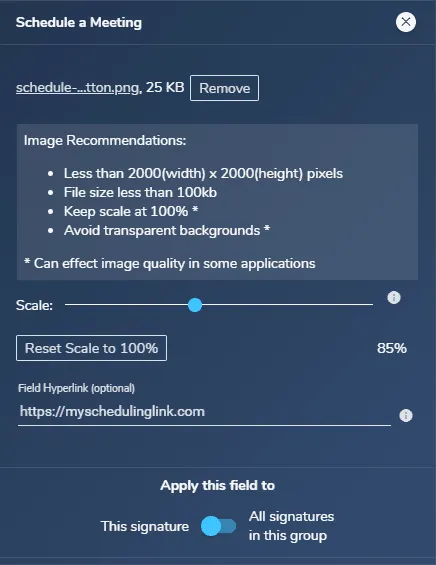 Once you have uploaded your button image, place your scheduling link into the Field Hyperlink section. This is the link where people will go to book a meeting with you. The service you use to book meetings should give you a booking link which you can use. For example, if you use Calendly to schedule meetings, they will provide you with a link you can use. 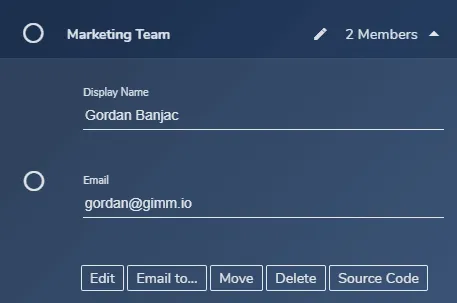 Install your new email signature with the meeting schedule button by clicking the Installation tab and then clicking “Click here” to get your signature. You will also get a set of installation instructions for your email client. 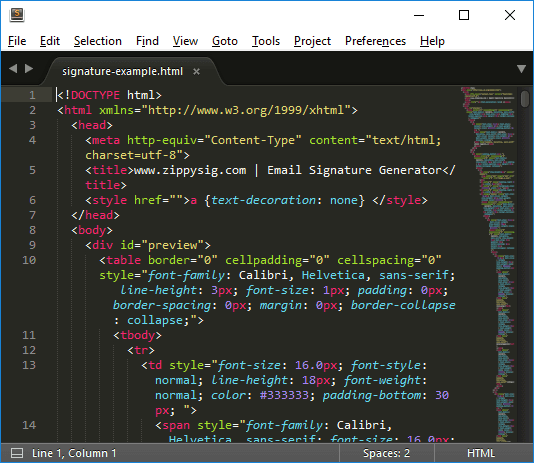 Open your email signature HTML file with a good text editor such as Sublime or Atom. Take a look at the code to find where the last element is placed. For example, if the last element in your signature is a Google Plus icon, you will need to have a look around to see where it is placed. A good way to do this is to do a search (Ctrl + F) for “Google Plus” or just “Google” and it should find the filename or something similar which might help you locate the section. Generally speaking, you will want to place the schedule meeting button right below the last element in your email signature (and maybe have some spacing between them). When you insert this code into your signature, you may need to put it inside a TD (table data) element which might be inside a TR (table row) element and so on. However, since this is outside of the scope of this article, you can read more about HTML tables and how to create an email signature here. Once you’re done editing the code, save the file. Here’s an example email signature with a Schedule Meeting button already in there which you can download and take a look at to understand how the code is placed. Open your new signature in a web browser like Chrome to make sure it looks right. If your signature looks right, install it into your email client. Not sure how to install your email signature? Check out our installation instructions for help. If you’ve tried everything and cannot get the button to appear or can’t get it to look right, feel free to try our email signature generator where you can easily add a “schedule a meeting” or “book an appointment” button without having to code it yourself in HTML. 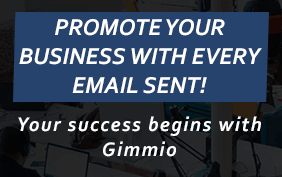 Most of the time, it’s really easy to add a meeting schedule button to your email signature. Other times, it can be more involved, especially if you have a bit more of a custom design. However, when you get it right, it can make a world of difference to the number of bookings you receive. To create an email signature with a calendar booking button in just 5 minutes, try our free email signature generator.